Community spirit - "Off Topic"
View Poll Results: Should this become a permenant - sticky - feature of the PT Development section? PS. I did not found Justing Biber in PT threads so we are not doomed yet! Noooooo! Now you've done it! It's all *your* fault Vormav! This thread should contain "polite" off-topic conversation. Anything which is offensive will be removed. Anything which is in-offensive, but inappropriately placed runs the risk of ending up here. If it gets the "seal of approval", this topic will become "sticky". All in favour, please feel free to say Aye. Those opposed to the very idea are also welcome to say Nay. The poll will remain open until sometime (world time varying) around the 1st of August. Last edited by bobsobol; 22-06-11 at 11:48 PM. Reason: My voting. Re: Community spirit - "Off Topic"
Aye... but OPer can come back at any time and close thread just for some lulz? Well... his OP is now just one of many in *my* thread... so I guess he can't. That wasn't intentional. I meant to leave his post in his tread... alone. 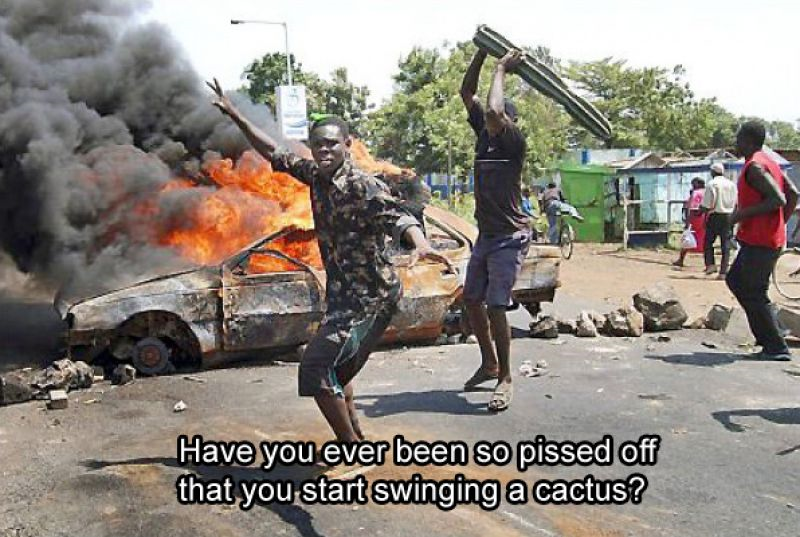 Cactus are fantastic for all sorts of reasons. They can quench thirst, heal wounds, make amazing soup or salad, and can even be worn as clothing. Some have stringy insides which can be woven into a kind of cloth, and I've even seen Cactus paper. If his intention is to put the fire out in that car... I think he should have spun it into a blanket first. Tom Cruise dances to Old Time Rock and Roll by Bob Seger! Those girls attempting to make a custom "risky business"/ old time rock and roll video clip. I can watch that 100 times and still laugh. Last edited by tnrh1; 24-06-11 at 09:21 PM. Humour is a very strange thing. It was amusing for me to see Tom Cruise so young again, (I hated him so much as a kid) but watching people in horrendous accidents I find disturbing, while other people are laughing their heads off. Or, if I'm going to be fair to British R&B, I have to list Jessie J.
YouTube - Jessie J - Price Tag ft. B.o.B. Going back to DVs post, as for D-12 (the band who are usually known only by their lead singer EMEINƎM) I congratulate their success, and their promotion of racial integration in popular music, (something Hip Hop has always done well) but for the most part... I find the lyrics offensive and am more than tired of hearing them everywhere I go. This is their ultimate track. This was when I absolutely did get what they where talking about and want to run with it. Now, I've just heard too much of it. Last edited by bobsobol; 25-06-11 at 02:44 AM. Let me show you a nice cover of me and a girl playing the song "Nothing else matters" by Metallica. It isn't a cover... it's video of a guy playing drums in time to the original track. We only hear the original, so when you hear percussion that you don't see him play (happens a couple of times, and looks pretty odd) that's him stuffing up. this video HAS to be true! I'm no master in drumming, but i guess this song is veeery hard... and its a very good song though. Last edited by SheenBR; 26-06-11 at 04:32 AM. I wouldn't have used the word "fake", as I say, we can see him making mistakes, but don't hear it. The video does make it very clear the level of effort required on the percussionist part to get that track right. The first video in your last post, I would guess is genuine. He fails to match timing with the double kick drum a couple of times, and unlike the first version, we can hear it, even if we don't have the split-screen close-up shots of the kicker-stick. The track is... Meh. It's okay, I'm sure it would grow on me. I'm still an old git, and my tastes in "Hard Rock" are much more classic. Annihilator are still tight as ever, and Jeff Waters owns lead guitar... but the new lead doesn't have the power or vocal range of the original. I still love their Jazz like ability to completely switch the tempo on a dime. Not a great "live" band, but very creative and artistic in composition. Both, probably from the same time period as Imris cover. I like alternative / Emo stuff like Dead Weather too. Rock is "nostalgia" for me. I love it, but it's not very "now". Has it really changed as much as we have since this classic I still remember fondly? Last edited by bobsobol; 26-06-11 at 07:18 AM. I like one or two songs of Megadeth, some of metallica, ac/dc but very little. btw, this song is GREAT!!! Last edited by SheenBR; 27-06-11 at 12:22 AM.